Our LGX adapter panels are designed to easily fit into our indoor, outdoor, and rack mount enclosures. LGX adapter panels are 5.3" by 1.2" with two push latches (spaced 4.65" apart). 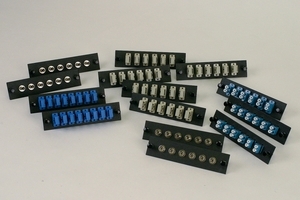 They are made from powder coated steel and are pre-loaded with desired connector adapters. Push pin fasteners provide an easy mount and a secure and snug fit.